The project Business Cases for Milk Cooling analyses experiences from dairy value chains in South Asia and East Africa to identify high potential clean energy interventions for increased efficiency and economic opportunity in Kenya and India for milk cooling. It is a joint project funded by GIZ and implemented by REEEP, and both organisations have launched project-related activities in January 2017. On Monday May 22nd Blane and I met with the IGEN Access team at the GIZ Delhi office who were assigned to work with us during this mission trip and supported us throughout the week. We talked to the TATA Trust right away, who explained to us the concept of "milk producer companies", a private model in the dairy sector where farmers are shareholders of the dairy company. Then MART Consultancy presented us a detailed overview of the four models of dairy procurement in India: co-ops, private dairies, "milk producer companies", and the informal sector. There is a high demand for milk in India, with seasonal ups and downs. While supply is limited by low yields, India is still the world’s #1 producer of milk. Challenges were seen in the cold chain infrastructure as well as a lack of workers for skilled jobs and suitable technical innovation. One the 23rd of May we discussed the role of renewable energy in the dairy sector with WEFT Research - we learnt that solar power is already used rather widely for the SNF testing equipment. Gender was also brought up: women quite often lead co-ops, but they have little power to make decisions to buy and invest. Larger amounts of money are usually handled by men, in the family as well as in co-ops. The consultants of KPMG explained that in the unorganized cold chain, fuel contributes about 30% of the cost (compared to 10% in developed countries), and the chain is generally insufficient. It was highlighted that while regulatory barriers are currently low, awareness of available technologies and their prices as well as resistance to change are the big challenges. The NDDB (National Dairy Development Board) invited us on May 23rd and explained that the unions collect milk twice daily at all villages. Milk arrives at chilling centres within 3,5 hours to avoid spoiling. Inclusiveness is mandatory for the co-op model: 70% of their poor farmers produce 60% of the total milk they collect. Many farmers deliver only 2-3 L of milk and own 2-3 dairy cows. We then spoke to Jaipur Union (25/05/17), which represents 21 unions in Rajasthan. Up to 800,000 L of milk is collected and chilled daily in the Jaipur region alone. We were also able to speak to Paayas Dairy in Jaipur on May 24th, which operates as a "milk producer company". Like co-ops, Payaas offers their farmers veterinary support and fodder, or feed for cattle. They are currently trying out solar-powered testing systems for SNF (fat content, a major quality indicator for dairy in India) and weight and have started to roll them out when replacing old testing systems. Milk losses are "at zero level" because of tight procurement and a highly efficient value chain at Paayas. 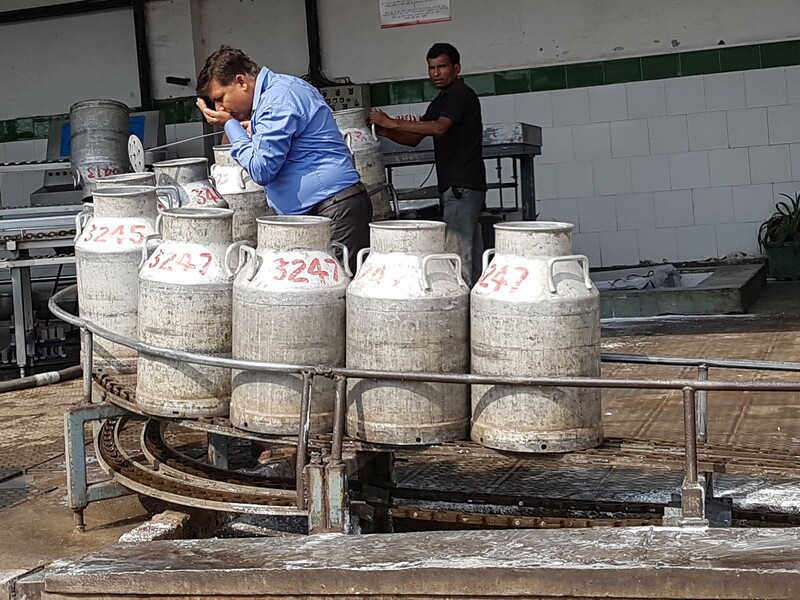 Our last day, May 26th, was spent visiting the stages of the co-op value chain in Uttar Pradesh (“Ananda Dairy”): dairy farmers - collection centre – chilling facilities – processing plant. We saw solar set-ups for SNF testing, and witnessed sensory testing of each can (45 L) of milk arriving at a chilling facility. The “milk chiller” (1000 L capacity) we visited actually belonged to a private entrepreneur, who mainly sells milk to the traditional value-add sector, for example sweet-making. It was mentioned several times that innovation comes mainly from the private sector, especially regarding machines/technologies. Unions are open to testing new technologies, too, especially if presented with convincing facts from pilot projects. RCDF (Rajasthan Co-operative Dairy Federation) (met on May 25th) have tried solar water heaters, for example. Federations as well as private dairies would need a fully costed business plan that demonstrates the cost savings of the new tech. That provided, we were assured interest is certainly there for modern milk cooling systems. Many stakeholders urged us to start innovation projects in the milk-cooling sector within the next 2-3 years, since the regulatory landscape and political setting would be favourable. Furthermore, prices for new technologies, especially solar, have recently dropped and might reduce the payback period to no more than 2-3 years, rendering projects more feasible. At household level, milk losses are minor and interventions currently not needed for cooling; it was accepted as a given by private and co-op actors alike that savings on energy costs at chilling facilities will translate into higher incomes for the farmers. The dairy sector is seen as a livelihood program and we have learnt that about 85% of the retail price of milk is paid to the farmers. Since margins are razor thin in the sector, and India is very price conscious, any intervention we might propose has to demonstrate real savings potential to be considered for uptake by the players. If we are able to demonstrate such potential, demand for innovation exists from the unions and dairy companies alike. We will keep you posted about this project and any follow-up initiatives!